Studios hoping to capitalise on Johnny Depp's current hot status are banking on the release of Secret Window to exploit the attention the eccentric actor has received for his out-there performance in Pirates of the Caribbean. And while Depp gives a solid performance in this David Koepp thriller, it's an understated role in a mediocre movie that will likely send Depp back to the character-driven roles he's always preferred. Depp is Mort Rainey, a successful writer who's divorcing his wife (played by Maria Bello) after discovering her affair with a mutual friend (Timothy Hutton). He's holed up in a woodsy log cabin where writers block has put him on the couch instead of in front of his word processor. But when a mysterious figure named John Shooter (John Turturro) arrives at his door and accuses him of plagiarising a long-forgotten story, Mort Rainey's world begins to unravel. Director David Koepp (Stir of Echoes) penned his script from a Stephen King novella, and the story has all the earmarks of a King tale  isolation, mystery and an interest in exploring the inner life of the writer. But where Koepp has proven himself an excellent writer (having penned Unforgiven, Panic Room, Spiderman and Mission: Impossible), he hasn't matched his successes as a director. 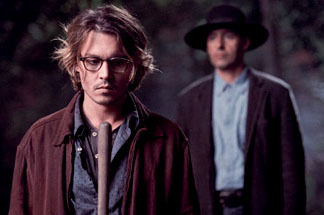 Secret Window suffers from overworking its material, as Depp runs around trying to prove to a seeming maniac that his work is his own.